Today, technology and innovation are driving changes in ways that we have never imagined, and changes appear at every level of our economy and our society. If Hong Kong is to continue to flourish, we must ensure that our young people be given every opportunity to succeed, every opportunity to tackle real-life challenges with innovative ideas and an analytical grounding. That, ladies and gentlemen, adds up to education inspired by a formidable foundation in science, technology, engineering and mathematics, or STEM in short. While a mathematical solution is seldom as eye-catching as a physical invention, the elements of creativity and innovation in STEM are very much mathematics-based. Mathematics provides a reliable system and logical language for verifying hypotheses and proving new theories for the development of sciences, technologies and engineering. Consider your smartphone. It is the infusion of pioneer technology like AI (artificial intelligence) and big data sciences in our daily lives. But let us not forget, it is the use of mathematics and computational thinking which provide the solid theoretical foundation and efficient algorithms for the technological advancement that we are witnessing. It is the reason why my Government mandates that all students study mathematics and coding in their primary and secondary years. It’s also the reason why the Education Bureau advocates mathematical modelling as an integral part of STEM education. That allows students to experience mathematics at work in real-life situations, from the control of traffic lights to weather forecasts. Of course, I’m not suggesting that every student become a mathematician. What I do hope for, or what my Government is working towards, is encouraging a community-wide, economy-fuelled awareness and appreciation of mathematics. It is, after all, a universal language, and our future demands that we be fluent in it. At the same time, we are also encouraging excellence in mathematical research, for which I’ve committed additional resources since taking office in July last year. The highlight of that commitment is an undertaking in my Policy Address delivered in October this year to inject $20 billion into the Research Endowment Fund of the UGC (University Grants Committee). I am naturally delighted to be here today to congratulate the winning team and the finalists of this year’s competition, and applaud the 260 students in more than 90 teams who participated. I understand that they come from over 60 Hong Kong schools, and among them 19 are participating for the first time. This is testimony to the excellent work of Hang Lung Properties, the Chinese University of Hong Kong’s Institute of Mathematical Sciences & Department of Mathematics, and all awards committee members, which make the Hang Lung Mathematics Awards such a great success. My thanks as well to the mathematics teachers and professors involved, whose dedication helps nurture so many brilliant students for Hong Kong. 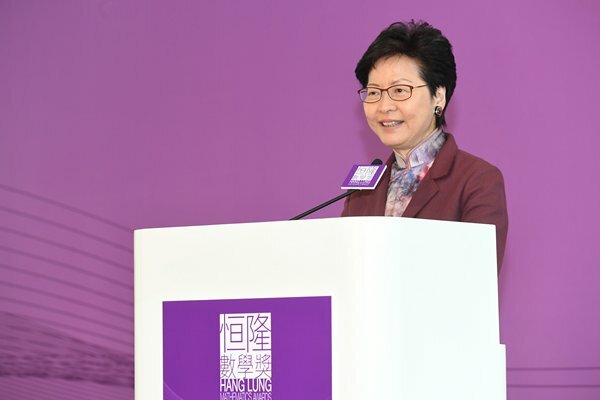 Chief Executive Carrie Lam gave these remarks at the 2018 Hang Lung Mathematics Awards Announcement & Awards Presentation on December 20.